Barack Obama has blocked publication of gruesome pictures of Osama bin Laden's corpse, expressing concern that they might incite extremists to retaliate. But Reuters, in a release not authorised by the US government, distributed disturbing pictures of three other men killed at Bin Laden'sPakistan hideout. Obama, in an interview with CBS to be broadcast at the weekend, explained why he opted against publication of the Bin Laden picture. "It is important for us to make sure that very graphic photos of somebody who was shot in the head are not floating around as an incitement to additional violence," the president said. Some, including within his own cabinet, had argued in favour of publication as proof that the al-Qaida leader was dead. But Obama said that even if the photos were published, there would still be those who would deny it. "The fact of the matter is you won't see Bin Laden walking on this earth again," the president said. Security in New York and Washington, as well as at US bases and embassies around the world, has been stepped up to cover the event of any al-Qaida revenge attack. The debate over the pictures came after a difficult 48 hours for the White House, forced on to the defensive for offering conflicting accounts of the raid on Abbottabad which raised questions about the legality of the killing. The pictures that were released provide a sense of the extreme violence employed by US Navy Seals as they stormed through the compound in the early hours of Monday. Two men lie in pools of congealed blood; a third lies prone with his arms flung over his head. Around are scattered hints of life before the Americans struck: computer cables, bedding, a tin mug and a plastic gun. Survivors of the attack have been taken into custody in Pakistan, including Bin Laden's Yemeni-born wife, Amal Ahmed al-Sadah, and his 12-year-old daughter. A Pakistani intelligence official said Bin Laden's daughter had claimed that her father had been shot in cold blood in front of her. But the official did not confirm a report by al-Arabiya news that the girl is claiming her father had first been captured and then shot, which would have been in breach of international law. George Little, a CIA spokesman, denied Bin Laden had been held by US forces before being shot. 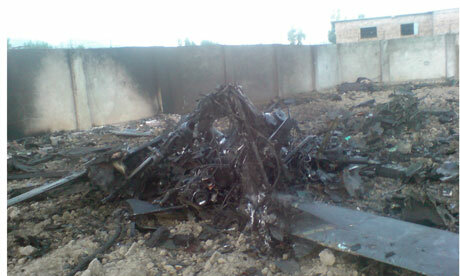 "There is no indication that Bin Laden was somehow captured and later killed inside the compound. It would be wrong to suggest otherwise." The US has not yet asked Pakistan for permission to speak to the family. Such a request could open up a fresh rift between the two nations. The Pakistan intelligence officer said if the US submitted a written request to interrogate the family, "given the [critical] statements coming out of Washington and the fact that this [raid] was not an operation we were involved in, we would not accept." Questions about the legality of the killing have grown after the White House backtracked on Tuesday on its initial account of the mission and admitted that Bin Laden had not been armed. The White House spokesman, Jay Carney, refused to provide further details. Asked whether the team that killed Osama had come under fire, Carney said the White House had gone to the limit in providing details and that any more would risk future operations. "I am not going to get into operational details," he said. Asked about the legality of the killing, Carney read from a prepared statement. "The team had the authority to kill Osama bin Laden unless he offered to surrender, in which case the team was required to accept his surrender if the team could do so safely. The operation was conducted in a manner fully consistent with the laws of war. The operation was planned so that the team was prepared and had the means to take Bin Laden into custody. There is simply no question that this operation was lawful." Eric Holder, the US attorney-general, giving evidence to a Senate committee, insisted it had not been a "kill" mission but "a kill or capture" mission. "If he had surrendered, attempted to surrender, I think we should obviously have accepted that, but there was no indication that he wanted to do that; and, therefore, his killing was appropriate," Holder said. Andrea Prasow, a Washington-based spokeswoman for Human Rights Watch, said: "Our position is that we do not have enough information to determine whether the killing of Bin Laden was lawful. We hope the US government will provide a more detailed accounting of what happened, so we can understand if it was in fact lawful under either international humanitarian law (the so-called law of war) or under human rights law." Philippe Sands, a University College London professor currently writing a book on the making of modern international law, said much would depend on the exact circumstances of Bin Laden's death. "If no one else was around, if they had him in a room unarmed and the building was covered, then it looks pretty bad," Sands said. He added that the US would have an additional layer of defence under international law. The "doctrine of necessity" excuses wrongdoing if the actions taken can be demonstrated to be the only way to protect an essential interest, such as the lives of a large number of citizens. Benjamin Ferencz, an American lawyer who was a US prosecutor at the Nuremberg trials and who lives in New York state, asked whether the killing was justifiable self-defence or premeditated illegal assassination. He would have preferred for Bin Laden to have been captured and put on trial. Ferencz, 92, said: "The picture I get is that a bunch of highly trained, heavily armed soldiers find an old guy in pyjamas and shoot him in the chest and head, and that borders, without access to more facts, on murder." He added: "Even [the head of the Luftwaffe Hermann] Göring had a right to trial."